Nice job with the kit. I like it. Cute card!! Thanks for playing along with us this week at the Party Time Tuesdays Red, White and Blue Challenge!! well this is just too dang cute! Love the image. Very cute card. Thanks for joining us for our Anything Goes Challenge at Loves Rubberstamps. Cute card! I really like the background paper. I need to at least make a patriotic card to post tomorrow! Cute card! 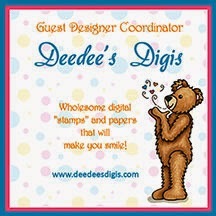 Thank you so much for playing at Loves Rubberstamps!